Virtually all known human cultures possess beliefs in the paranormal. This may at first seem maladaptive—how could belief in the unreal be sufficiently advantageous that it would have survived the rigors of human evolution in the all-too-real world of past ages? Such beliefs may have yielded evolutionary advantages. Although the interaction of culture and human evolution is complex, it is certainly possible that shared paranormal beliefs within any given culture, such as shared veneration of ancestral spirits or god-kings, might have yielded a coalescent group loyalty that would be useful, physically and politically, in dealings with other competing cultures. This might very well have resulted in a selective bias toward dissociative processes, leading to success in those cultures that indulge in such beliefs. But even if this is the case, a significant psychological question arises—one especially true for the modern world, in which access to scientific information is effectively unparalleled historically—How are such beliefs maintained in the minds of individuals, within any given culture? Why do individual people harbor bizarre beliefs? Previous laboratory research has demonstrated the importance of psychological characteristics that predispose individuals to paranormal thinking. In earlier research (Sharps et al. 2006; 2010), we showed that subclinical levels of depression were important for belief in ghosts and extraterrestrial aliens. This is presumably because the depressed would prefer to be in an environment where things might be better; and things might be better in the afterlife represented by ghosts, or perhaps on another, nicer planet where extraterrestrials might live. Subclinical tendencies toward attention deficit hyperactive disorder (ADHD) predisposed people to belief in extraterrestrial aliens and cryptids such as Bigfoot and the Loch Ness monster. Why? Aliens and monsters are cool, and finding them in the woods and bodies of water takes us away from the mundane reality that those with ADHD tendencies frequently find excruciatingly dull. However, in these studies, the most important of the characteristics predisposing us to paranormal thinking was dissociation. Not only did subclinical levels of dissociation predispose people to beliefs in everything paranormal (whether UFOs, aliens, cryptids, or ghosts), but it also predisposed them to see these things. In a study in which we used Internet pictures of “paranormal” creatures and objects (Sharps 2012), the dissociated tended to see them as real. Where everybody else saw a teenager in a Halloween gorilla suit with extra monkey hair, those with subclinical dissociation saw Bigfoot. Odd lights in the sky (a helicopter with a broken landing light, for example) readily became UFOs for the dissociated. In short, those with subclinical dissociation tended to see the prosaic as real evidence of the paranormal. It is crucial to emphasize the word subclinical. People with dissociative characteristics are emphatically not “crazy.” All human beings experience some levels of dissociation in their everyday life without clinical significance. But those with more of these tendencies tend to see their world in vastly more paranormal terms. They not only believe in these things; they see them in stimuli that other people would immediately perceive as nonparanormal in nature. Subclinical dissociation was also important in the 2012 Mayan “end of the world” fiasco, in which an ancient Mayan god was (depending on which interpretation you believed) literally expected to surf ashore on a raft of very old (but presumably waterproof) sacred snakes and establish a New Order of peace and so forth. We were privileged to publish two articles in the Skeptical Inquirer (Sharps et al. 2013; 2014) concerning the psychological factors that made it possible for modern human beings to believe in this type of baseless nonsense. We found that disturbingly high numbers of university students held very incoherent, but very positive, beliefs in the “Mayan end of the world.” Almost half of our research respondents thought it might happen; 10 percent were effectively certain that it was going to happen, and 10 percent thought it was still inevitable even after it didn’t happen. When one considers the requisite physical details (Mayan god, waterproof snakes, etc. ), one rather wonders what these students, exposed on a daily basis to modern science, were majoring in. Yet they bought it, and the number one factor producing this deeply bizarre set of beliefs was subclinical dissociation. Unfortunately, the term dissociation has many uses and definitions. In our usage, we emphatically do not refer to psychiatric concepts of dissociative identity disorder, or to a psychotic level of dissociation. We refer to subclinical dissociative tendencies, of the sort probably experienced from time to time by most people. Those with subclinical dissociative tendencies see prosaic reality as potentially fraught with supernatural meaning. For the dissociated, the facades of buildings, seen in everyday context on the street, might hide vast conspiracies or alien autopsies or Bigfoot. This type of dissociation may lead to a diminished critical assessment of reality; as discussed in earlier Skeptical Inquirer articles (Sharps 2012; Sharps et al. 2013; 2014), there may be anomalous perceptions of individual experience. The world may appear to be “not quite real or … diffuse” (Cardena 1997, 400). This is emphatically not “mental illness.” However, the disconnection with immediate physical reality that occurs with subclinical dissociation might incline many normal people to view highly improbable things with more credulity (see DePrince and Freyd 1999; also Sharps et al. 2013; 2014). Compulsory education does not cure this sort of thing. College students frequently engage in superstitious or “lucky” behaviors when approaching examinations and tests in their classes, especially when the consequences are perceived as particularly important (Rudski and Edwards 2007). Almost half of our college students (Sharps et al. 2013; 2014) thought that the Mayan apocalypse might happen, and 10 percent were sure that it would. So, we know that dissociation contributes to paranormal beliefs and perceptions. But how pervasive is it? What types of paranormal thinking and perception are associated with dissociative tendencies? This was the focus of our present study, which used standardized instruments to address the question. Forty-one male respondents (mean age 19.37 years, SD = 1.73) and sixty-three female respondents (mean age 19.21 years, SD = 1.37) participated in this study. These respondents completed the Dissociative Experiences Scale (DES; Carlson and Putnam 1986). This is a standard instrument for the assessment of dissociative tendencies, used previously in a number of our experiments, including those published in the Skeptical Inquirer (e.g., Sharps 2012; Sharps et al. 2013; 2014). The DES deals with empirically verified everyday experiences that relate strongly to dissociation, the focus of the current research. The respondents also completed the Revised Paranormal Belief Scale (RPBS; Tobacyk 2004). This scale addresses paranormal beliefs of various types, addressing beliefs in such areas as the soul, magic, and cryptids. This standardized instrument addresses, on an empirical basis, many of the paranormal beliefs current in Western culture. Finally, respondents completed the standard Duke University Religion Index (e.g., Koenig and Bussing 2010), which deals with religious behaviors related to the supernatural (e.g., church attendance). The relationship of overall scores on the RPBS to dissociation in this non-diagnosed, normal population was significant (linear regression), R2 = .171, F(1,101) = 21.70, p < .001, β = .423. Especially interesting is the fact that all factors identified as paranormal were significantly (p < .05) related to dissociation as measured by the DES. In other words, tendencies toward subclinical dissociation, in this normal, non-diagnosed population, were strongly related to all forms of paranormal beliefs. In terms of relationship to subclinical dissociation, Religiosity was most strongly related by beliefs in heaven and hell (β = .281). Magic was most strongly endorsed by beliefs in witchcraft (β = .167), although beliefs in specific cases of witchcraft was another matter; see below. Luck was most strongly endorsed by a fear of black cats (β = .268). Future Prediction was most strongly endorsed by a belief in astrology (β = .270). (Belief in cryptids, for this scale, dealt only with the Abominable Snowman and the Loch Ness monster; Bigfoot and his allies were conspicuously absent from this instrument). Nessie was strongly endorsed, β = .420, while the Snowman was not. We address this important dichotomy below. Fate of the Soul was most strongly supported by belief in the possibility of communication with the dead (β = .185), with belief in reincarnation a close second (β = .164). Belief in astral projection fell a distant third, β = .064. Finally, psychic powers were endorsed most strongly in mental “object moving,” β = .224, although psychokinesis, effectively a synonym, was endorsed less strongly (β = .109; see below). Two additional items of the RPBS tested DES scores against modern scientific perspectives. The first, a belief that “mind reading cannot occur,” was nonsignificant against dissociative tendencies. However, the second, that there may be life on other planets, was endorsed more strongly and significantly by the dissociated, β = .231. Interestingly, no significant relationship was found between dissociation and the scales of the Duke University Religion Index, which at first appears to conflict with the significant relationship of the DES to the Religiosity scale of the RPBS; but wait. Dissociation, as measured in this subclinical population by the DES, was significantly associated with every index of paranormal thinking measured. Those with dissociative tendencies were more likely to believe in heaven/hell, witchcraft, the danger of black cats, astrology, the Loch Ness monster, communication with the dead, reincarnation, and psychic powers. However, belief in the Abominable Snowman, specific instances of witchcraft, and psychokinesis were not as strongly related to dissociative tendencies. Why not? Previously (Sharps 2003; 2010; Sharps et al. 2013; Sharps and Nunes 2002), we presented a continuum in human information processing, in what is called the Gestalt/Feature-Intensive Processing theory. This continuum ranges from feature-intensive processing, in which the specific details of a concept are given specific consideration in depth, to gestalt processing, in which a given concept is considered without detailed analysis, with relatively uncritical acceptance of the given idea as a whole. We suggest here a relationship between dissociative tendencies and gestalt processing, the relatively uncritical, detail-free consideration of given phenomena. In 2012, enormous attention was given to the Maya prophecies in media and in other sources. This, according to the availability heuristic of Tversky and Kahneman (1973), made these prophecies relatively salient to the entire population. These prophecies were relatively available, to everybody, in various media sources and were therefore immediately salient for people thinking about these issues. However, for most people, there would have been some feature-intensive consideration of these prophecies; feature-intensive analysis tells us that ancient societies, such as the Mayans, lacked modern scientific understanding, and so their prophecies might not be right. Also, a serious, feature-intensive consideration of an ancient Mayan god surfing ashore on a raft of long-suffering, six-hundred-year-old waterproof snakes becomes immediately ridiculous. However, those exhibiting subclinical levels of dissociation, with consequent gestalt processing tendencies, would not engage in the necessary feature-intensive thinking; they would not think about the time involved, or the snakes, and would thereby credulously entertain the Mayan “prophecies.” In our previous research (Sharps et al. 2013; 2014), that’s exactly what they did. The ludicrous, feature-intensive details would be lost in favor of a gestalt, an idea something like “the god will return.” This gestalt processing would necessarily result in a consequent strength of belief in a god-ridden “New Age,” without the bothersome concerns engendered by feature-intensive, scientific, appropriately skeptical analysis. These considerations are underscored by the exceptions to this pattern we noted earlier. More dissociated individuals believed in the Loch Ness monster than in the Abominable Snowman. Why? The Snowman is little seen today in televised and Internet accounts, taking a decided backseat to Bigfoot and his cronies. The Abominable Snowman is historically an earlier concept, less “available” to modern thinking in Tversky and Kahneman’s terms. Thinking about this older concept would require more feature-intensive concepts to consider, more in-depth thinking about a relatively unfamiliar idea. The Loch Ness monster, on the other hand, is seen in TV “documentaries” all the time. Even with its historical provenance, it is therefore a modern concept, relatively “available” in Tversky and Kahneman’s terms, more amenable to modern thinkers, and hence more readily processed in gestalt, feature-free terms. Therefore, the dissociated tend to endorse Nessie relatively freely. The Snowman takes more work, more feature-intensive analysis, and is therefore less readily endorsed. We saw the same effect with astrology and astral projection. Astrology is a still-current, relatively available concept, requiring little feature-intensive analysis. Astral projection, a concept whose televised and Internet popularity has waned, would require more feature-intensive analysis, and would require less detail-free gestalt consideration for easy acceptance. The same effect applies to “object moving” and “psychokinesis.” Mental object moving requires no analysis at a feature-intensive level; it is eponymous. “Psychokinesis,” although effectively a synonym for “mental object moving,” is an earlier, currently less available concept, which requires additional thought, activating feature-intensive processing. Thus, mental “object moving” was endorsed with its automatized, eponymously gestalt characteristics, whereas the more feature-intensive, but synonymous, concept of psychokinesis was not. Finally, the same phenomenon was observed in the endorsement of “witchcraft” as a general, gestalt phenomenon, but in the absence of statistically significant endorsement of specific instances of witchcraft, which would require more feature-intensive thinking. The general phenomenon was endorsed; the specific instances were not. 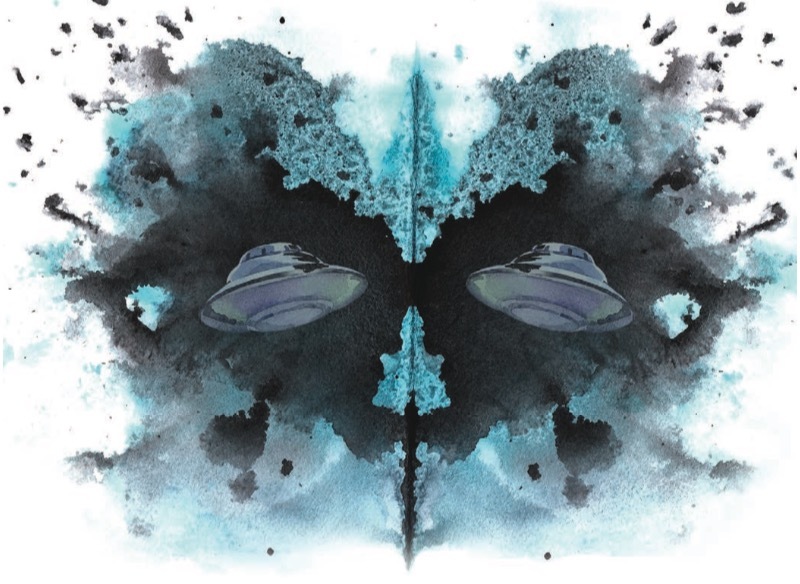 From all of these instances, the pattern is clear: when broad, noncritical gestalt processes are involved, the dissociated tend more toward paranormal beliefs. When analytical, skeptical, feature-intensive processes are required, paranormal beliefs recede, at least to some degree. What about the Duke Religion Index? No significant relationships were found between dissociative tendencies and the scales of the Duke Index. Is this an exception to the considerations discussed above? The answer is no, although this situation opens important avenues for future research. The Duke scales predominantly assess religious activities, not beliefs. This index addresses tendencies to engage in church attendance and related activities rather than specific ideas about theological phenomena. Church attendance and such are precisely the activities that would have allowed one to adhere to local standards in the vastly more religious ancient world. Whether you believe or not, these activities allow you to insert yourself more firmly into a religious community, a crucial factor in the tribal societies of the ancient world. Human evolution has fostered the tendency to fit into society. Ancient societies, those in existence through the majority of human evolutionary time, tended to hold specific sets of beliefs. If you demonstrated your beliefs accordingly, you were accepted; if not, you were ostracized, frequently with fatal consequences. The potential adaptive significance, the evolutionary advantage, is obvious. In any given ancient society, as long as you demonstrated your beliefs, regardless of internal cognitive processes, you were an acceptable member of the society. If you did not do so, you were ostracized or killed. Thus, we see a potentially important dichotomy between actual gestalt and feature-intensive beliefs, and a demonstration of the importance of apparent conformation to these beliefs in socially acceptable venues. Those who engaged in the appropriate religious rituals were most likely to succeed in most of the societies that preceded the modern era. Those who did not were ostracized or killed. This was true regardless of the internal cognitive processes of thinking or belief. Therefore, religious activities, as opposed to beliefs and as measured by the Duke Index, would not be expected to be influenced, substantially or significantly, by subclinical dissociative tendencies. The more successful, less dissociative individuals would historically be suggested to have engaged in religious activities to the same degree as everybody else, and we would anticipate this tendency to have continued into the modern world. However, the beliefs involved would be more likely to be endorsed by the dissociated; that is exactly what was demonstrated by the present results. Subclinical dissociative tendencies predispose people to paranormal beliefs. Those paranormal systems that require only gestalt cognition are more likely to result in the endorsement of such beliefs, as opposed to those that require more intense, feature-intensive thinking, which do not. These dynamics are more likely to be observed in the realm of paranormal or religious thinking rather than in the realm of locally approved activities (e.g., church attendance). The best way to counter such paranormal beliefs is to make use of educational interventions that involve feature-intensive analysis and thinking. Potential believers in paranormal phenomena are most likely to question these erroneous beliefs if provided with solid, feature-intensive educational environments in which they must confront such supposed phenomena as extraterrestrial aliens, cryptids, and ghosts in very specific terms. Our latest research shows that those who exhibit subclinical tendencies toward paranormal beliefs also tend toward subclinical dissociation. These tendencies may best be countered by detail-specific, feature-intensive, scientific education. Hopefully, these considerations may inform education at the primary, secondary, and collegiate levels to reduce paranormal beliefs in favor of scientifically legitimate thinking needed to develop realistic science and technology. Cardena, E. 1997. Dissociative disorders: Phantoms of the self. In S.M. Turner and M. Hersen, eds., Adult Psychopathology and Diagnosis, third edition, 400. New York: Wiley. Koenig, H.G., and A. Bussing. 2010. The Duke University Religion Index: A five-item measure for use in epidemiological studies. Religions 1(1): 78–85. Sharps, M.J., S.W. Liao, and M.R. Herrera. 2013. It’s the end of the world, and they don’t feel fine: The psychology of December 21, 2012. Skeptical Inquirer 37(1): 34–39. ———. 2014. Remembrance of apocalypse past. Skeptical Inquirer 38(6): 54–58. Tobacyk, J.J. 2004. A revised paranormal belief scale. International Journal of Transpersonal Studies 23(1): 94–98.